Celebrating a birthday, bachelorette party, graduation, or just want to get together with some friends? Our VIP tables are the perfect way to spend your night. Exclusive space, VIP entry and your very own bottle service girl. Contact Liz to book your table today. The Russian Lady is the ideal setting to hold special events and private parties. With our various rooms, bars, and dining areas we have the accommodations to suit any guests’ requests. From small private events, to larger corporate celebrations, our expertise and setting allows for the best patron experience. We also offer top of the line audio and visual equipment to suit your entertainment needs. Any listed package can be customized by our Sales and Events Manger to fit the needs and/or wishes of our customers. Regulations: The Russian Lady requires a total guest count to be confirmed no later than seven days before the date of your event. We will set, staff and prepare food for the number of guests that you have guaranteed, so please try to be as accurate as possible. If the attendance of guests falls short of the given count, you will be responsible for 100% of the guaranteed number. If the attendance falls short of the minimum number of guests required for a party package, you will be charged for the minimum number of people required as well as the room charge. Billing: A banquet event order will be drawn up by our Sales and Events Manger for the Event Host to review which includes all associated costs and fees. A final bill will be presented at the end of the function as well at which time payment is required in full. Payment can be made by cash, credit card, or certified check. Deposits: A non-refundable 20% deposit must accompany all room reservations at the time of booking. The deposit will then be deducted from the final bill on the day of the event. 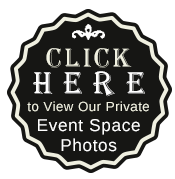 Charges: An hourly Room Rental Fee is applicable for all private events. Please contact our Sales & Events Manager for pricing. Menu Information: We require all menu and bar selections one week prior to your event. Cancellation Policy: We require one week’s notice for cancellation. Cancelation within one week is subject to loss of deposit and/or 100% billing.